How to apply for dentistry in australia ? How to practice in australia ? How to practice Dentistry in australia after completing BDS/MDS in India? The first step in the assessment (document verification) pathway is the initial assessment of your professional qualifications in General Dentistry or as a Dental Hygienist and/or Dental Therapist. 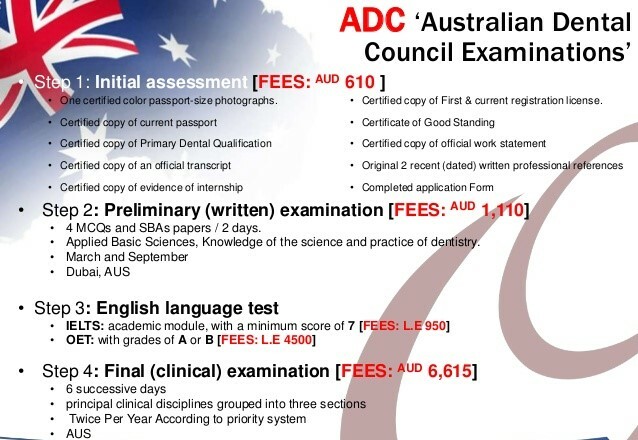 The Australian Dental Council (ADC) assesses your professional qualifications as a General Dentist or Dental Hygienist and/or Dental Therapist, work experience, registration history, good standing and other matters to establish your eligibility to proceed with the examinations. This assessment is based on the information you provide in your Application for Initial Assessment of Professional Qualifications in Dentistry, or Dental Hygienist and/or Dental Therapist . It takes a minimum of eight weeks to conduct the initial assessment of qualifications. Please ensure that you allow sufficient time for your initial assessment to be approved in order to meet the Written Examination closing date deadline. The Australian Dental Council’s Written Examination is designed to test your knowledge of the science and practice of dentistry and to assess clinical judgement and reasoning skills relevant to dental practice in Australia. Each Written Examination session is held over two full consecutive days and two sessions are held each year, during the first half of March and September. The examination is computer delivered and is offered in multiple locations within Australia and overseas. The Written Examination consists of four papers containing both scenario-based and singlebest answer Multiple Choice Questions (MCQ). Each examination consists of a different set of questions, however the standard required for a pass in each examination is the same. The four papers must be completed in one examination session, i.e. it is not possible to sit one of the papers in March (or September) and the remaining paper/s in September (or March). 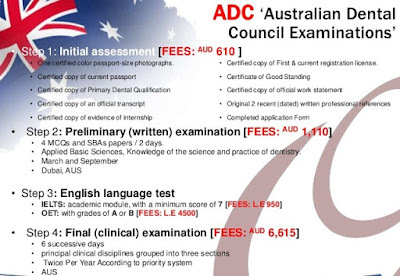 There is no restriction on the number of attempts allowed for the ADC Written Examination, however a new application is needed and the examination fee must be paid for each attempt. A pass in the Written Examination is valid for three years only. This means that candidates who pass the Written Examination must pass the Practical Examination within three years of notification of a successful result in the Written Examination. Candidates who do not complete the Practical Examination in this timeframe must re-sit and pass the Written Examination to again become eligible to enter the Practical Examination. Candidates applying to sit the Practical Examination must have a valid Written Examination at the closing date of the relevant examination. Note that the closing date for an examination may differ from the end date of an application period. The Written Examination is valid for three years (3) years from the date that results are notified to candidates via the online Candidate Portal or the letter of notification of results. The Practical Examination will be held over two days, and is designed to test the application of clinical skills and judgement in a simulated clinical environment. Candidates will be required to complete 12 tasks from the following list, with the tasks allocated to candidates on each day of the examination. In addition, Infection Control will be assessed throughout the examination. The results of the general dentistry Practical Examination will be published on the ADC Candidate Portal. The publishing of results onto the website will normally be done within six weeks of the examination. Results will not be released by telephone, fax or email. The results of the dental hygiene/dental therapy Practical Examination will be emailed to candidates within six weeks of the examination.